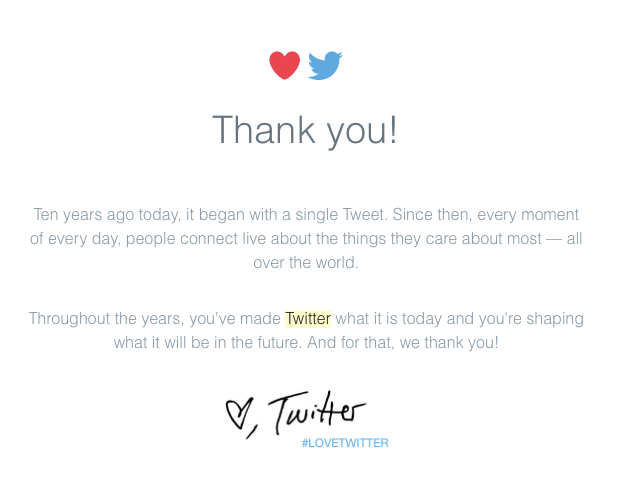 While today is Mother’s Day, it also marks another important day: the 10th birthday of Twitter. With #TwitterMemories and #LoveTwitter becoming trending topics today, I decided to take a walk down memory lane with my fellow Twitterarti. Career. Twitter gave me insights into the startup world and tech specifically. It made me realize I didn’t want to spend my career in Oil & Gas. In the years since I switched industries, I’ve gotten contacts, as well as job leads, thanks to my Twitter activity. Blogging. It encouraged me to start my blog in 2010 that opened up the world of brands and PR. A perspective I would have never gotten earlier and what ended up being a practical education in marketing. Friends. When I look at my friends in Dubai today, I can split them into 2 groups: high school and Twitter. Some of my closest friends I can trace that initial connection to Twitter with whom I’ve celebrated highs, lows, birthdays and weddings. Opportunities. As I built my network and became more involved, there were so many opportunities that came my way. Fun ones like movie premieres, to meeting key business contacts at conferences abroad. My world would definitely be smaller and less interesting without Twitter. Awareness. I don’t think there’s a single news event I didn’t first come to know on Twitter. From the new Apple releases to traffic jams on Sheikh Zayed Road, news breaks first on Twitter. And of course, Kanye’s tirades. My Voice. Perhaps the most beneficial thing has been the development of my voice. From a shy, introverted girl to a confident woman, Twitter allowed me to test my voice and share my opinions. Editing your thoughts down to 140 characters really makes you evaluate if something needs to be said and how it should be said. Bonus is realizing thousands of people are listening and taking action based on your words. Twitter might not be as glamorous as Instagram or Snapchat but ten years later, it provides the most utility. I’m still hoping for improvement around features like Lists or making discovery easier, but I still love the core product. So if you’ve neglected your Twitter account, perhaps this is a great time to give it another shot. And of course, you’ll find me there @dollz87.